This beautiful twist makes you stand out from the rest of the class. While this hairstyle looks complicated, it’s as easy as tying your shoes. After styling your hair, gather the two front sections of your hair and bring them to the back of your head to meet in the middle. Tie the sections into a bow and using bobby pins that match your hair color, set the knot in place. This look can easily become your favorite with how easy it and cute it is. It’s definitely ours. This cute look won’t make you look like a fool. We love a hairstyle that works perfectly with short and long hair! All you need to master is the simple braid to accomplish this look. Part your hair down the middle and French braid the front sections of your hair until you reach the back of your head. 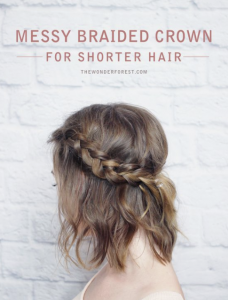 Either pin the two braids together to meet or tie them into a small bun. No one can mess with this look! Waking up bright and early sometimes means waking up to the inevitable bed head. Put the hat away. We won’t need it today. 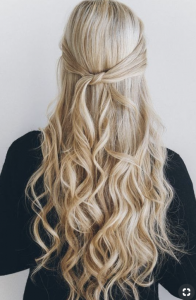 There are still so many cute and easy hairstyles you can do with your messy hair. Let’s break down the two-minute low bun. Pull your hair into a low ponytail. Create a small gap above the hair elastic and pull your ponytail through the hole. Loosely braid the remaining ponytail and then tuck it into the gap with the rest of your hair. Use a strong holding bobby pin to set it in place. If you want to give it a more casual look, pulls some pieces out to frame your face. Cute! Don’t miss class because your hair is making you late. A messy top bun never disappoints and never makes you late! This style is great if you need to hide the fact that it’s been a couple of days since you washed your hair. Don’t worry, we’ve all been there. Gather your hair together on the top of your head as if you were going to set it into a ponytail. Instead of setting your hair in a pony, twist the hair really tight and then let it fall on top of your head. 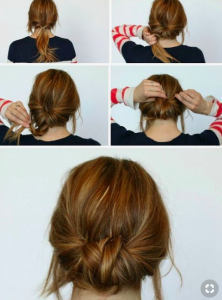 Using bobby pins or a hair elastic, set the bun in place. Throughout the day strands of your hair will naturally fall from a bun giving it a more carefree look. 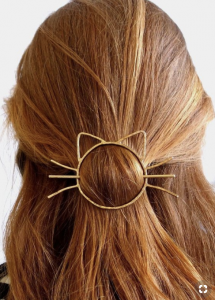 Pop quiz, who loves hair accessories? We do! Accessories can take any hairstyle and give it a fresh new look. Styling a braid through your hair, using a flashy clip to keep the hair from your eyes, or even tying your hair with a ribbon. No matter what accessory you use, have fun with it! You can play around and really show your personality with what you put in your hair. Nothing is better than going to school to learn about something that you absolutely love. If beauty is your passion then why not get an education in it? Enroll in our cosmetology program to learn everything we can teach about hair and beauty! Not convinced? Read our blog to see what the perks of being a cosmetologist are. Make sure to contact us for more information.